You get a trifecta of news for LVS this morniong ! Oh My!! SINGAPORE—Singapore's nascent casino sector could rival that of the Las Vegas strip in the next two years as Asian gamblers opt for the newer resorts closer to home over the traditional casino center. Forecasters are already looking to upgrade their expectations for the industry following better-than-expected second-quarter results for Genting Singapore's Resorts World Sentosa, one of two casino-resorts in the city state. Genting Singapore opened the casino at its resort complex in mid-February with rival Las Vegas Sands Corp. following with its $5.5 billion Marina Bay Sands resort in late April. The combined daily winnings of both casinos in the second quarter alone suggest an annualized Singapore market of $4.0 billion. "It's just proof that if you build it they will come and in Singapore they built two products that are worthy of that title," says Andy Nazarechuk, Dean of University of Nevada Las Vegas' Singapore campus. HONG KONG (Dow Jones)--Retail outlets at Las Vegas Sands Corp.'s (LVS) Marina Bay Sands casino resort in Singapore could generate annual sales of more than S$1 billion when the complex is fully operational, said David Sylvester, senior vice president of Sands' Asia retailing operations. Sylvester said Wednesday about 50 more shops will open at Marina Bay Sands in September, including Dior and Hermes outlets, bringing the total number of stores to over 150. When fully operational, Marina Bay Sands will have more than 300 stores and restaurants. To date, the company has signed contracts with future tenants for around 95% of the mall's capacity, said Sylvester, who was once group general manager of the retail assets in Australia and China of GIC Real Estate, the real-estate arm of sovereign-wealth fund Government of Singapore Investment Corp.
NEW YORK — Las Vegas Sands said Wednesday it plans to pay off more than $1 billion in outstanding debt because of its previously announced amendment to a credit facility. 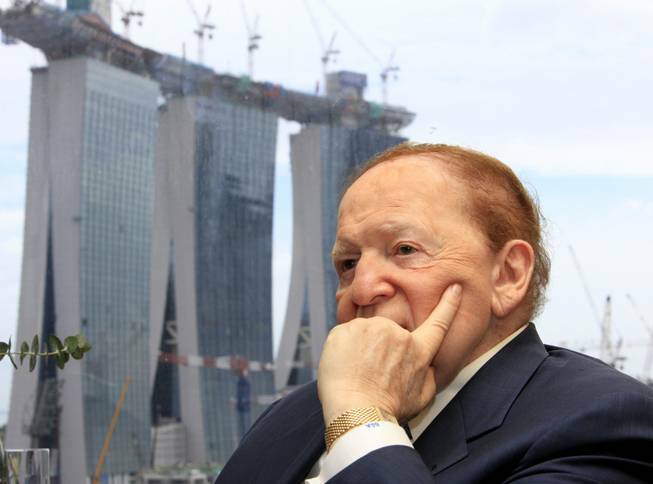 The casino and resort operator led by billionaire Sheldon Adelson says the amendment extends the maturity of nearly 75 percent of its $3.9 billion in term loans and pushes their maturity to 2015 and 2016. In addition to strengthening its cash position and overall financial profile, the company also says the payment gives it the opportunity to grow its business in emerging gaming markets. If you listened to the last earnings call from LVS, the inflection in Sheldon's voice told you that Singapore was going to be huge. They're playing Wall Street's game. Underpromise and over deliver to get a higher multiple!! yeh MGM has been frustrating as heck but I'm just sitting with it as I'm down on it.